Yipee, mum is home and we is snuggling on the couch and keeping warm. Hope all of my furiends are warm and safe too. I know there is a nasty storm with ice and snow going south of us. While winter can be a pain, it can also be lovely. A few weekends ago we had freezing fog which then gets on the trees and stuff. Mum calls it hoar frost. You can biggify the pictures for your enjoyment. Then a few days later it got all melty and we had a puddle from the drips off the patio roof, so some fevvers came to plan in it for a bit. Mum says it will be a weekend of the usual chores and stuff for her, plus working on her knitting, she is making lots of progress on the blankie. Happy Weekend to all. Stay warm and dry. BRRRRRRR, it has gotten all cold here again. Mum opened the door to get stuff in from outside and whoa, it is frosty out there. Mum gotted a big box the other day, she called it a box of sunshine. Two trays of these little orange balls that mum eats, one every day! She says that is so she can keep all healthy during this winter. This morning while I was sitting by the windows that go to the floor, a dove flew directly into those windows! He made a big 'thunk' and turned around and flew away. We even have decals on the windows so that fevvers don't fly into these windows. But mum says doves are a bit stupid, at least that is her opinion. Mum came home tonight and went out to make sure all of the fevver feeders were all full. With it being so cold, they eats so much more. She even had to replace both of the suet cakes. Me, I am doing my best to stay warm, hope you are too. You look funny upside down mum! Yeah I agree with that. Mum says I am a lover kittie first thing in the AM when she gets up. Then for a little bit when she comes home from day hunting. After than I will ask for scritches on my terms but sometimes mum comes after me anyway. If I really don't want the attention I start growling. It was warmish, rainy, foggy for most of the weekend. Mum spent lots of time running around doing stuff on Caturday, plus dinner with Miss Lynn. The worst part is mum gotted stopped in the metal monster by the local police! Seems her brake light had burned out. She was good and gotted it fixed right away so now she is in good graces again with the local police. 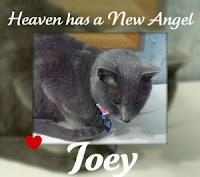 My furiends over at Zoolatry were so kind to send this over to me and a lot of other kitties. Thank you. 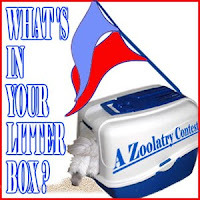 Plus they are doing a contest called "What's in your litterbox". Well other than the obvious stuff, nothing else. I don't hide my toys there! Go check out the contest. The Stouper Bowl Matchup is set. Mum is furry happy that The Colts beat them Jets for the AFC Championship! I know that will make the gang over at Cat Naps in Italy happy too. They are from Colts territory. Now on the NFC side, it was quite a game. It went into sudden win overtime and The Saints prevailed. True to form, Brett the Viking didn't have a good championship game, he threw 2 interceptions and there were a bunch of fumbles by the Vikes too. Mum is happy, there is no way she could support the gang in purple. So on to the Stouper Bowl in two weeks on February 7. Let the hype begin. OK here is the picture with mum's count, and she says there are ten (10) fevvers sitting on the tree. Getting some sun and getting warmed up. They are either sparrows or house finches. It has been warmer this past week so a bit of melty stuff going on. But the weather guesser says we will get rain on the weekend, but not as bad as my buds out of the left coast. Mum says she is happy it is almost the weekend and it was a short week for her too. Mum says the weekend will be filled with the usual stuff, cooking, cleaning, laundry, shopping, knitting and feetsball! OK mum while she was watching the fevvers a few weeks ago when it was really cold out. She noticed that they were sitting in a tree nearby in the sun. So she zoomed in and got a picture. So just for fun, see how many fevvers you can find. Biggify the picture to get the best view you can. 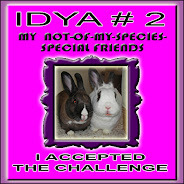 In a few days we will publish the picture where mum has the count on the picture. You see, wire telegraph is a kind of very, very long cat. You pull his tail in New York and his had is meowing in Los Angeles. Do you understand this? And radio operates the exact same way; you send signals here, they receive them there. - Albert Einstein. OK Al, if you say so, but I have never seen a cat that had its tail in New York and its head in LA! That would be one long, skinny cat! Feetsball Report - Divisional Playoff Edition. On Caturday, The Colts and The Saints won. On Sunday Brett and them Vikings won, along with the Jets. Chanpionships will be next Sunday. The Colts and Jets play, along with the Saints and Vikings. Mum did lots of work on the blankie project and is now over half way done. She works on it lots while the feetsball game are one. Me checking out the inside of the big cold box. I did gets some ham this weekend when mum had some in a sammwich this weekend. I also gots lots and lots of treats as mum uses them to keep me out of her yarns! I also went outside this weekend, not on my own. Mum scooped me up in her arms and took me outside for a bit, said I needed some fresh airs. She did put my front paws down on that wet, cold white stuff. I want some green grass please. Mum says the green grass may be a few months away. Good news is mum doesn't have to go day hunting on Monday. So extra time for me and extra treats too. Eric and Flynn were so kind to give me this award this past week. The Superior Scribbler Award was started by The Scholastic Scribe to celebrate their 200th post. To read more about the Superior Scribbler Award click HERE. 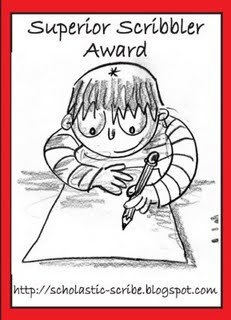 Each Superior Scribbler (SS) must pass the Award on to 5 deserving blogger friends. Each SS must link the author and name of the blog from whom he/she received the award. 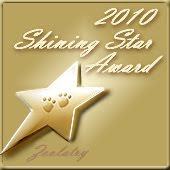 Each SS must display the award on his/her blog and link to the post which explains the award. Each SS is asked to visit the post which explains the award and add his/her name to the Mr. Linky List. Each SS must post these rules on his/her blog. 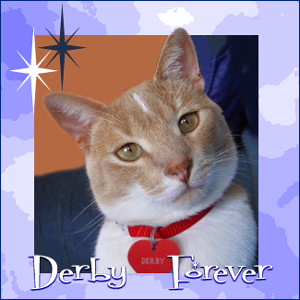 I would like to pass this award on to the following serious scribblers, five blogs but more than five kitties! In other news mum is busy doing cleaning, washing the clothes, really cleaning the human litterbox room really good. Smells lemony fresh! Me I have been napping, waiting for the sun to come out from behind the clouds, watching birds and when mum fixed herself a sandwich for lunch, got to get some ham. Later it will be time for feetsball and mum can work on her blankie project while she watches. Mum got this picture this past week, she noticed that I was resting my front right leg up on the heaty blowy thing. Said I looked cute. Hey, I ALWAYS look cute! 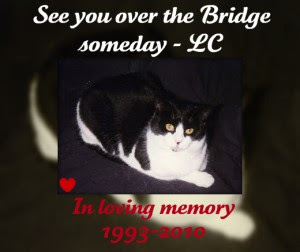 Bye, LC, you lovely Lady Cat, we will miss you, but it was nice to have known you while you were here. You were a good role model for Ayla and Iza and they and TBT will miss you too. Have fun at The Bridge. Mum put out a new little feeder for the fevvers. She bought peanuts in the shell and then took them out of the shell and into this feeder. For the past week or so nothing was around it. Mr Squirrel has figured out how to get down the long hook. Come up with a peanut. Mum wonders what will happen then the peanut level gets lower and he can't reach it. Then a lovely little white breasted nuthatch showed up to munch, this is what mum wanted to feed at this feeder, little fevvers who like peanuts. He froze in position and didn't move for the longest time and mum noticed all the other fevvers were gone. Mr Hawk, trying to find a snack of his own, was sitting in our neighbors tree! Mum kept watch, Mr Nuthatch probably was very still on the feeder for at least 5 minutes, then scooted away. Then when no more fevvers around, Mr Hawk too off too. Yep, I agree with this. If we weren't happy, then we would be on alert and awake. If we are happy with our beans, we know we have foods and all the we need, we can sleep. Quiet weekend around here, mum was around all weekend and Grampie was here on Sunday afternoon as well. Watching feetsball and mum working on the blankie. We had lots of sun so I had wonderful sunspots to nap in, birdies to watch at the feeders, silly squirrels in the snow too. The Pack - losted in overtime. Grampie was so disgusted at them that he said if they kept playing so bad he would want to go home early. They started to play better, tied the game at the end, but then losted the game with a fumble in OT. Crazy game, 96 total points. The Pats - Miss Millie's team also losted. Next weekend the Cowboys will play Brett and them Vikings; the Cardinal birds will be playing the Saints. On the other side the Ravens get to play The Colts and the Jets will play the Chargers. OK mum is laughing and grumbling at the weather guessers on TV. They got the snow totals all screwed up and the places that were supposed to get the most are getting the least and vice versa. They said for us 6-11 inches, we maybe got 4. Now they are saying 6-8, but they don't say if this is TOTAL snow fall or IN ADDITION TO what we already have. Mum says they need to be specific, but then we might be able to pin them down on something! This picture is from our big storm in December, but mum thought it was pretty to show. One thing that made mum happy is that when she got home she parked the metal monster out on the street. When she got out she realized that someone had already cleared out the snow from the driveway. So mum just had to put the garbage can away, it was empty, then drive the metal monster in to its room. Oh, mum is getting her coat and boots on, the big truck came and finally picked up our recycling. Mum can get that thing out of the street now. Oh yeah, I found a cute new little ginger kittie from the UK, Maximus Spittimus. If you haven't stopped by to say 'hi' yet, please do so. Me I thinks I will just nap. Happy Weekend one and all. Big purrs for my ManCat buddie Kismet. He may have heart failure or something really bad. Lots more info on Skeezix's blog. Joey had to be helped to The Bridge today. 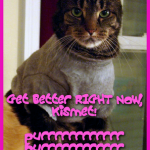 Stop by and leave them some comforting purrs. Otherwise mum is spending most of her time knitting! No puter time for me, little chance to check in with my buds. This is no not fair. Yeah we are peaceful, except when we are not. Playing THoE or just chasing imagined prey around the house. Putting the bitey on our beans. Chasing the red dot. Well we are into a new year. Mum finished her big fat book on New Year's night, now she is cracking on the blurpy blankie. She only had three stripes done when she restarted, she got 1 and a half more done when she took the picture Caturday night. Now she should have done by the end of Sunday 6 stripes. There are a total of 20 stripes that gotta be done, plus the edging. Mum says with the feetsball playoffs she will have time to work and get this done. The blurpy will be here in April. Mum says Grampie told her they found out it will be a girl, so Uncle Stormie, who will be the Grampie to this new blurpy is calling it "Tinkerbell". Mum says she needs to find a Tinkerbell toy to include with the blankie. I figured I can help too by sitting on it and getting it furrified. The little blurpy thing will have a kittie to live with, might as well get the blankie broken in by a kittie. Mum also took the Christmouse tree down, along with the other decorations. The snow guys are still out, but then there is still snow on the ground. I must be slipping, I haven't even knocked them down off the top of the TV this year. The Pack - They won, beating the Cardinals. They will play next weekend in the play offs and, deja vu, play the Cardinals. Brett and Them Vikings - Beat the Giant guys who haven't been playing well. Heading for the playoffs as the #2 seed and get next weekend off. If the Pack wins next weekend, then they will play the Vikes. The Colts - Lost playing in the snow at Buffalo, didn't play all of the good guys again this game. Heading for the playoffs and the #1 seed and gets next weekend off. Hope everyone is having a good new year so far. Mine and mum's has been quiet. Mum went to get Grampie and then they watch the Rosey Parade, had lunch and while Grampie napped, mum read. But the biggest thing that has happened here so far involved Mr Hawk. Mum had just gotten up and out of bed today, and came to sit with me to watch the fevvers outside at the feeders. At the big feeders were mostly doves. Then suddenly Mr Hawk swooped through, caught a dove and took it to the ground! Oh my BAST! Before mum could get the flashy box Mr Hawk took off with the dove in its talons. Mum and I have never seen the actual moment when Mr Hawk has caught another birdie! We have seen shortly after, with the hawk already having caught its victim. You can go back and see that here. Mum would like to correct that this is a Cooper's Hawk, not a Sharp Shinned one like she thought too. Here is one of mum's better pictures of Mr Hawk from a few years ago as he sat in our crabby apple tree, looking for his lunch. Me, I did lots of napping, but mum was being silly and put one of my new mousies on me. I am not amused.